Yes, this is good news indeed. Bad news is, the price cut and power increase does not apply in our sweltering country. Ours got launched some months ago. 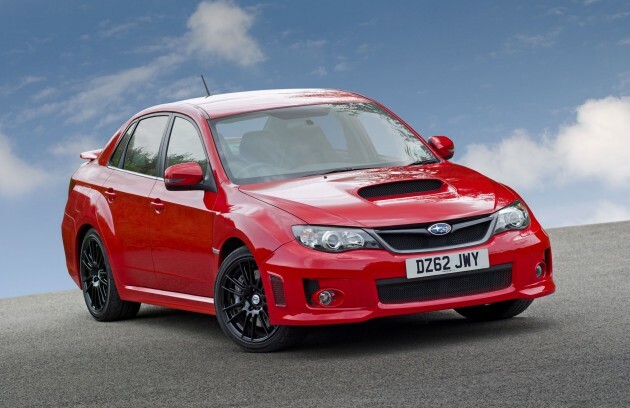 In any case, Subaru UK has just slashed the price of the WRX STI to £26,995. Wait, there’s more. If you buy the WRX STI and then pay an extra £1,599, you’ll get an upswing in power, three additional numbers and a letter to the name. So the full name of the car will be WRX STI 340R. As the numbers suggest, the 340R has 340 PS and 490 Nm of torque – an additional kick of 40 PS and 83 Nm to the standard engine. The AWD car completes the 0-60 mph sprint in 4.7 seconds, 0.5 seconds quicker than the standard car. Enchantments cast on the 2.5 litre boxer engine’s ECU made the power boost possible. Airflow is also improved thanks to the new exhaust system. 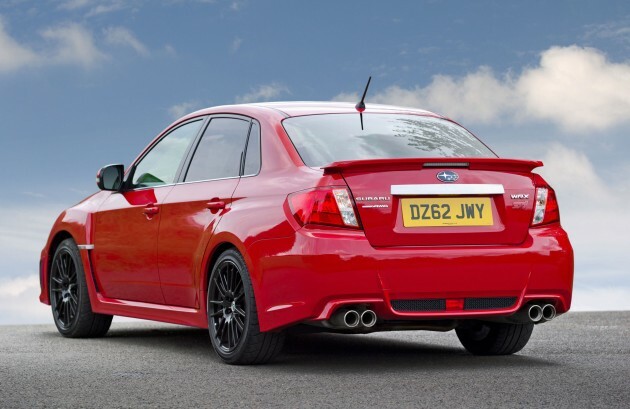 Notably, the new exhaust retains the car’s aggressive sound and the iconic Subaru burble. I blame the Govt for not getting such discount in this country. As a matter of fact, I blame all the shortcomings in this country to the Govt. 2.5L WRX STI Japanese market (300PS): combined fuel consumption is 9.0 km/l. No NAP buy 340R <RM150K. PM u help me abolish NAP I will help u by not coming to the polls. My hand allergic to the timbang kati symbol. So 1 less vote for ABU. He2. When it arrive here at almighty bolehland, it will costs a bomb. Cheaper, forget about it, BarangNaik will make sure everything is triple tax before coming in, and don’t forget about our weak currency. cannot say else where cheaper and malaysia is expensive..
eg in UK this STI is £27000… f30 328i is around £26000… VW GTI is around £27000..
but still how many over there can afford to buy with either cash or 36 months hire-purchase..? BUT you can see there are many F30/CGI/A4/GTI and also other Japs like LEXUS IS.. Accord/Camry… Altis/Civic/Lencer on malaysian road..
sales record from MAA also proven these car(s) has good sales record..
hence it shows the price is not a matter in Malaysia regardless of the tax condition..
Agree, it shows imbalanced economics growth in our country, where rich people are getting richer, middle class group remain. come on lah, what makes u say this? anyway, if we can have cheaper cars why not? why pay extra? its kind of true in fact; in malaysia people buy all sort of things regardless of the price point..
the people who support anti lynass is also supporting adding more cars in the road by reducing the tax.. we have enough car in the road..
i think that the correct way!!! It is inaccurate to say that tax do not effect the purchase behviour of cars; since that is a general statement. You really need to look into the relation of the tax against the puchase by the corporate or individual buyers. Brits pay almost double in income tax compared to us. Their cash in hand is less and though cars are relatively cheaper than us, it’s still expensive to them. We can choose not to buy a car, they can’t choose not to pay tax. I was in UK for 3 years before. I must admit that their goods are way damn cheap overthere – a pair of good Nike sneakers (Made in Vietnam) is around GBP 40-50. You bring GBP100 for shopping at Tesco can get a loadful of trolley with foods and stuff. In Malaysia, this is all just dream on. I dont think malaysia is a develop country at the moment. So stop comparing our car price with he develop countries. I prefer car price remains so that, there will less car on the road like 70s & 80s. The environment will be healthier. Last time we can use bicycle to school without any worries, especially from parents, being knockdown by cars. Sad to say nowadays, people are getting self centred, politically driven. I always dream that, people can go to work or school using efficient public transport. I think that is more suitable/appropriate for any political party to concentrate in developing a modern and efficient transport system, rather than reducing the car price. Probably that will come later. I dont want malaysia to be like Jakarta or India in recent time. But for poor citizens (e.g. with RM 2k monthly salary), this is no use. They never have to pat tax, but they have to pay a lot of money for vehicles that they need to carry their children, for business in pasar malam etc..
Till now…I still don’t like Subaru…because, they look ‘biasa-biasa’ only. until u see on the road and either get a test drive and u know how powerful and aggressiveness of a subaru, tons of subaru fans out there wont be wrong. Many Subaru fans will step out cause of the price and the maintenance, it can afford a C-class and 3-series or Audi a4. people keep comparing our car price with other country. but who care? car is necessity, everybody need it. i only hope the govt stop taxing national car maker like proton or perodua. if they dont let us drive toyota or honda at least let us drive proton, nowadays myvi cost about 50k! so ridiculous. people in arab saudi can buy proton cheaper than malaysian. the govt should look on this one. Ya more wrx sti will be seen on the road.Those who have low boost turbo car get ready to get smoke.I will be the first to smoke you guy,get ready,Haha.All hail my wrx sti.